One could never accuse me of being fancy when it comes to food and cooking. But there was something about the idea of preparing one of the world’s luxury food items that sounded like a good challenge to try at home… Now I have eaten foie gras on many occasions, most of the time I pick up 1 ounce cuts at a local market and quickly pan-seared them to put on top of my steaks. The couple of other times I’ve tried it were at French fine dining restaurants. In fact, France is the leading distributor of this yummy ingredient. Foie gras is a food product made of the liver of a duck or goose that has been specially fattened through force feeding, and this has not been without controversy. Through history there have been many bans on this product in different countries, including the United States. But with modern techniques of housing and feeding the animals, many bans have now been lifted. To learn more about the methods of how the animals are raised visit Hudson Valley Farms to watch a few short videos. This is the very first time that I purchased the entire liver, and my plan was to just slice it into portions, cook some for the holiday, and freeze some for later. But since I was having a big Christmas eve dinner I thought to myself, why not try something new? My first thought was to make a paté or terrine which is cooked in a terrine mold, usually a porcelain one with a tightly-fitted lid and steam cooked. I was a bit more interested in preparing “Foie Gras au Torchon” , because I have never actually tried this technique. Torchon is the sister to foie gras terrine. The only real difference is the shape and cooking preparation. Both terrine and torchon are made from raw foie gras and little else. 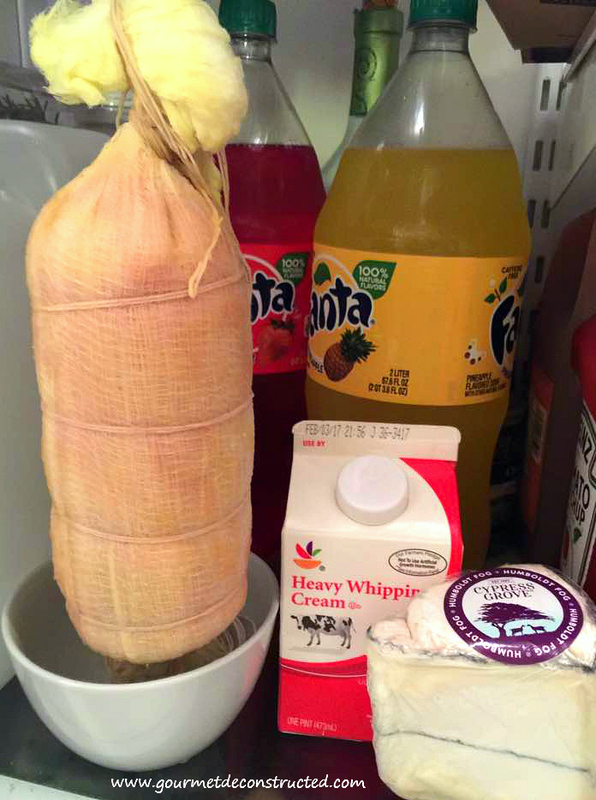 “Torchon” means “dish towel” in French, since the foie gras was traditionally wrapped in a towel for cooking. This towel helps to get the cylinder shape that it has. Foie gras torchon is a very popular item in Thomas Keller’s “The French Laundry Cookbook”, so I chose to use his recipe and method with slight changes. 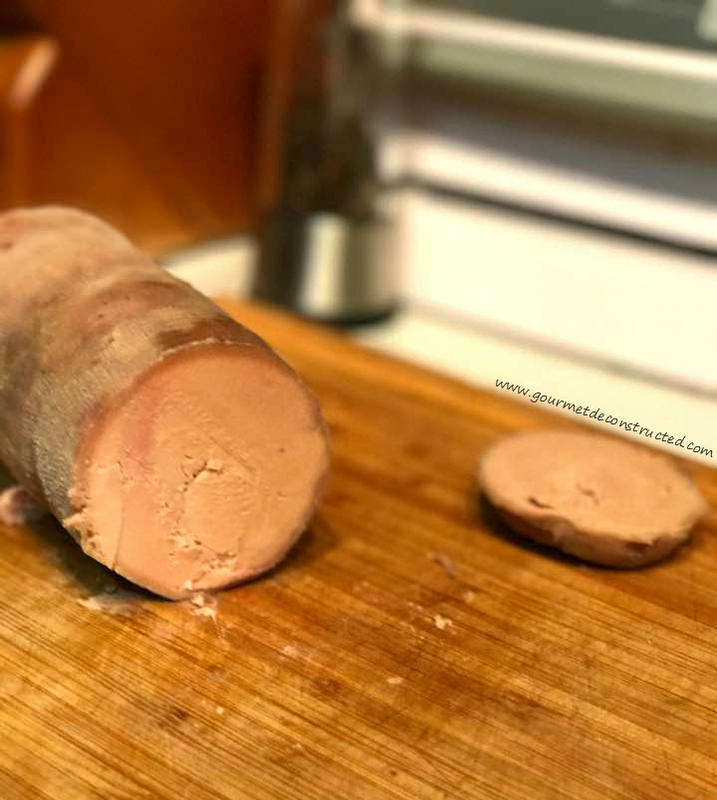 This recipe takes a few days to prepare and can get a bit messy during the de-veining process, but it was one of the most satisfying kitchen tasks I’ve ever performed and the torchon turned out perfect! There are very few ingredients to distract from the rich, buttery taste of pure foie gras. This is my first step by step with pictures of the production, and I hope I am clear enough so everyone at home can follow. Enjoy! 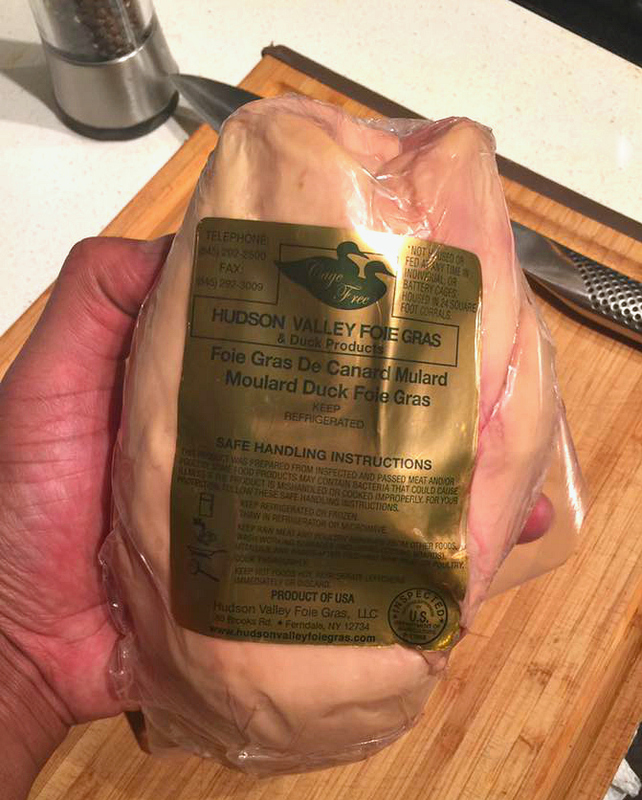 Day 1: Remove the foie gras from its package, place in an air tight container and submerge in milk, then cover and refrigerate for at least 12 hours. Put the dry seasonings in a bowl and mix well. Remove the foie gras from the milk and dry with paper towels. Spread a double layer of plastic wrap across your prep surface and spread half of the seasoning mix all over it. 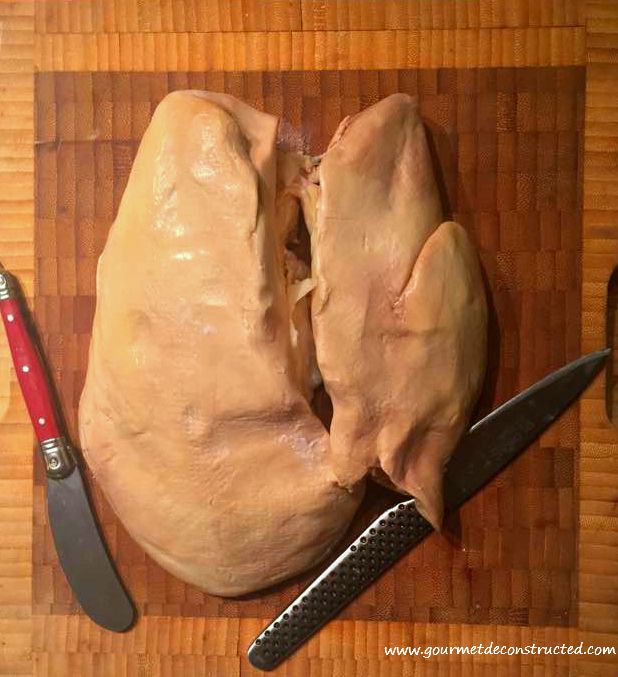 Pull apart the two lobes of the liver and prepare to remove as many veins from the foie gras as possible. This step is important because it gives the finished product more of a refined appearance. If the veins are left in, you will have defined red spots in the finished product. Remove any membranes from the outside of the foie gras. Start by butterflying the large lobe. Holding your knife at a 45-degree angle, slice through the lobe to the vein, following its path and pulling foie gras apart. You will notice the vein clearly. Make a surface cut at each side of the vein and gently scrape outward to butterfly the lobe. 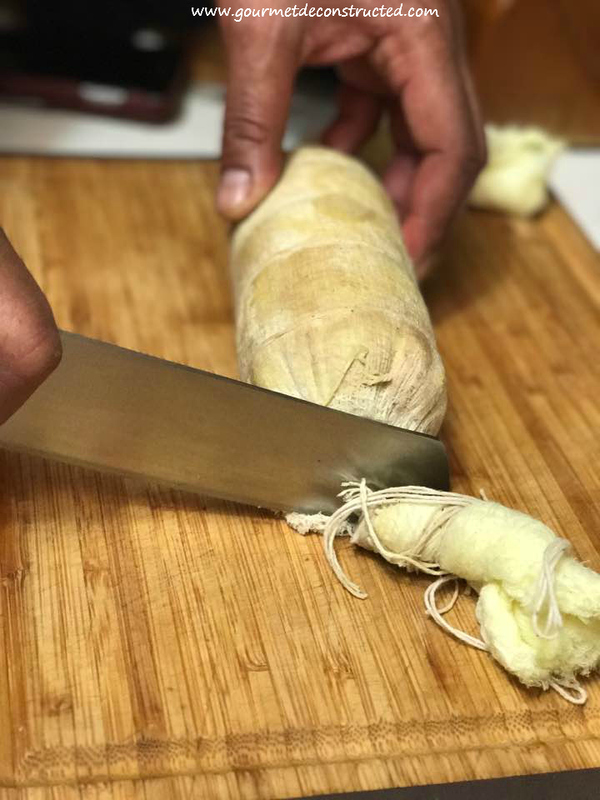 Be sure to scrape far enough with the tip of your knife to open the folds and expose the network of the veins leaving the outer skin of the foie gras intact. First, pull out the smaller network of veins located right above the thickest veins using the tip of a knife and your fingertips then continue down where all the thickest veins are and carefully pull them out. Try to remove as much of the vein network in one piece as possible. There are smaller veins throughout the liver that should be removed as well. It does not really matter how much you cut and scrape the inside, you’ll be able to reform the lobe. Once cleaned, fold over the sides to return to its original shape. Repeat the same procedure for the small lobe. Arrange the de-veined foie gras on the seasoned plastic wrap skin side down and add the remaining foie gras scrapings, seasoning, and the Cognac. Roll firmly into a log and refrigerate for 12 hours. Day 2: Remove foie gras from the refrigerator 30 minutes before reshaping it. 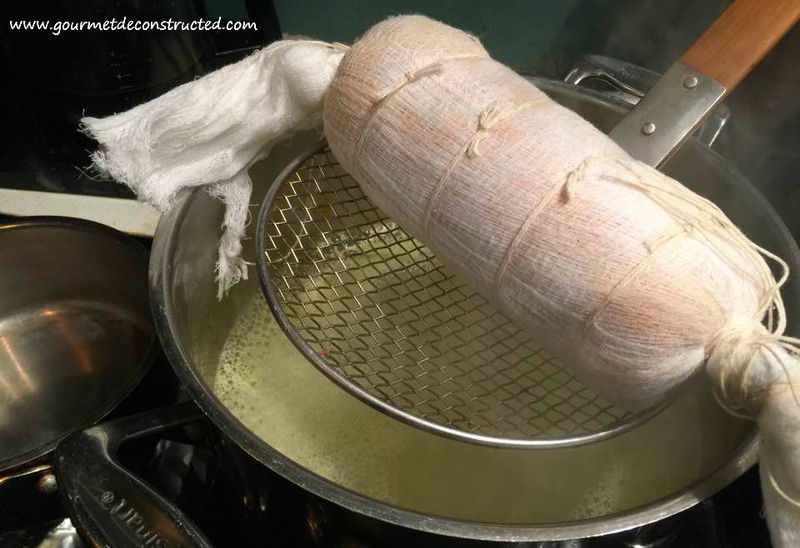 Layer two large pieces of cheesecloth or use a large white torchon on the countertop. 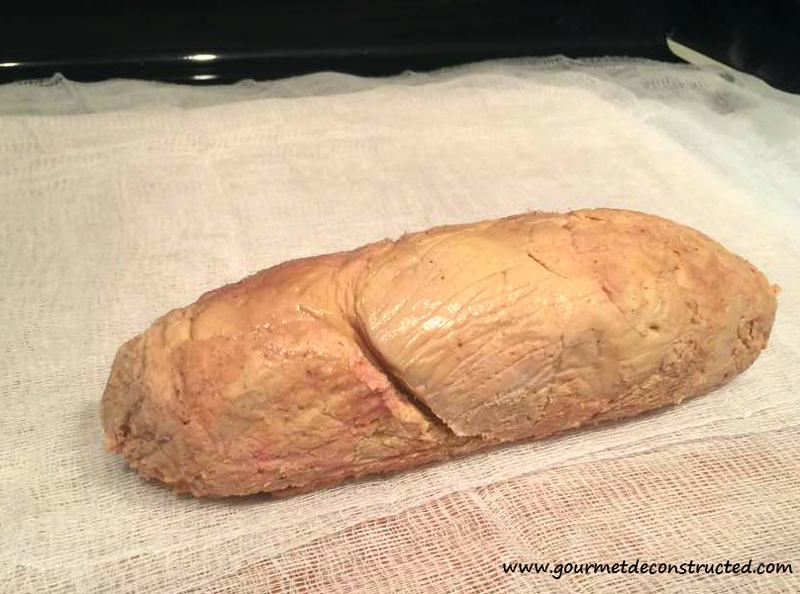 Unwrap the foie gras, discard the plastic wrap and place it along a short end of the cheesecloth. 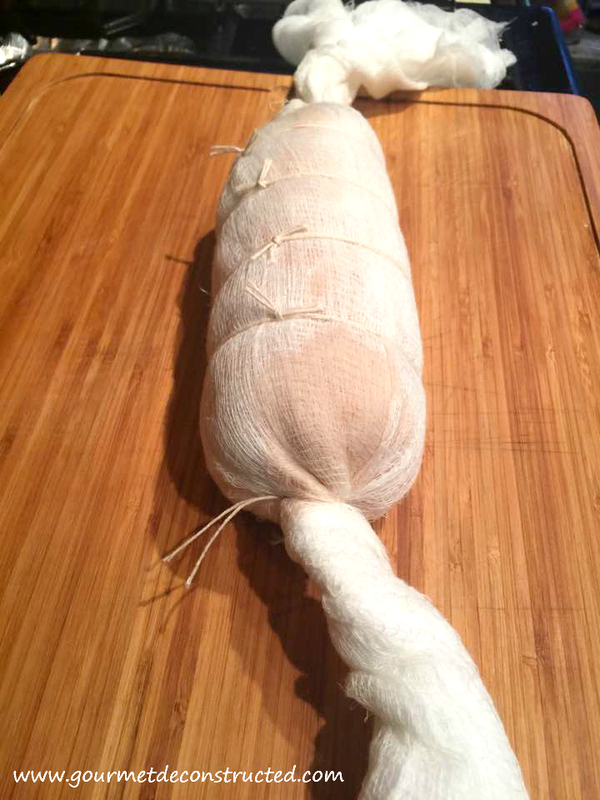 Rolling it away from you, roll it up in the cheesecloth into a tight cylinder twisting and pressing one end first as you roll to force the foie gras into a compact log. At this juncture, hold one end of the cheesecloth tightly and wind the string around the end and tie a knot. Continue rolling the log from the other side to compress into a very tight log until you’ll see bits of foie gras being forced through the cheesecloth. At this time your foie gras is at room temperature and it can be poached right away but it would have to be reshaped into its original form after cooking. If you want to skip this reshaping step; refrigerate the log 24 more hours or until it has completely hardened and poach it. The torchon will keep its original shape and less fat will be wasted. Day 3: Bring water or stock to a simmer. Carefully immerse the foie gras in the simmering liquid and poach for 90 seconds. Transfer immediately to an ice-water bath to cool. 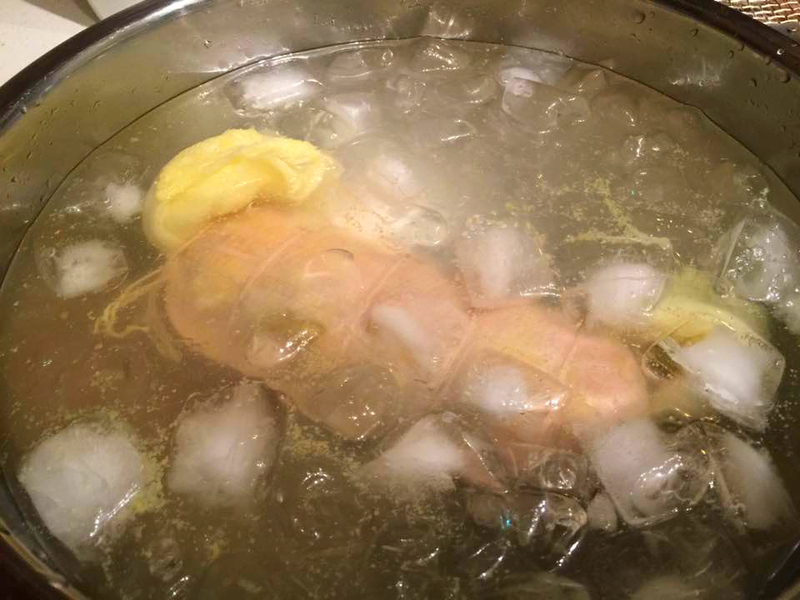 Once chilled and hard enough, remove from ice-water twisting the ends of the cheesecloth to tighten again. Hang the foie gras from a shelf in the refrigerator 12 hours or on a baking tray lined with sheets of paper towels. Just before serving, remove the cheesecloth. The outside of the foie gras should be grey and oxidized. Cut the ends from the log and slice into 3/4 inch pieces using a sharp knife dipped in hot water, reheat knife before cutting the next slice. If you want, you can use a round cutter slightly smaller than the slice to cut away the darkened exterior of the torchon which is optional. Serve on top of toast with the condiment of your choosing. Bon Appetit! 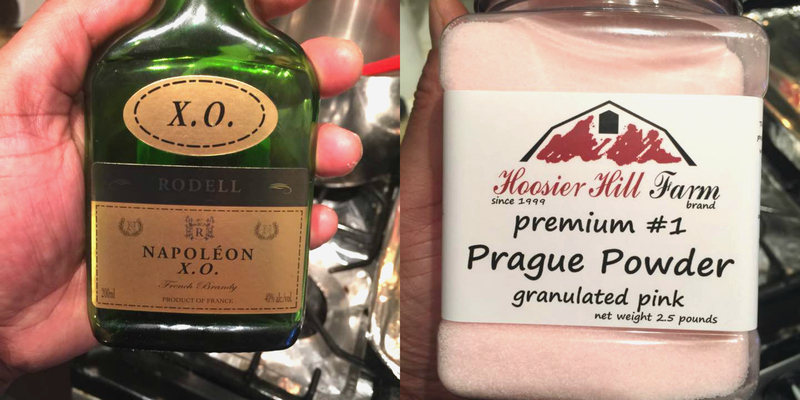 Posted on December 29, 2016, in Poultry, Wild Game and tagged appetizer, cheesecloth, cognac, curing salt, duck, duck liver, Foie gras au torchon, fois gras, french cooking, french food, french laundry, french recipe, goose, goose liver, hudson valley farm, poached. Bookmark the permalink. 4 Comments. Let us know how it comes out! It was smooth like butter Chef Justice! Thank you for the love and attention to detail that you put into your craft. It definitely translates well into every bite of your food! Keep up the great work!